Even as global attention fades, the humanitarian crisis in eastern Ukraine is deteriorating. United Nations Secretary-General Ban Ki-moon has voiced grave concern over the continuing hostilities in eastern Ukraine amid an escalating rebel offensive which has locked civilians in a zone of intense fighting. 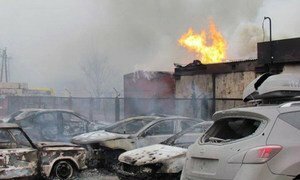 In a statement issued by his spokesperson late yesterday evening, the Secretary-General said he was particularly distressed over the plight of civilians in the city of Debaltseve, situated along the conflict's frontline, where they remained trapped without basic services and under constant danger from indiscriminate shelling. A recent uptick in fighting in eastern Ukraine between Government and anti-Government forces has seen casualty figures spike with 224 civilians killed and 545 wounded in the three weeks leading up to 1 February. According to the Office of the UN High Commissioner for Human Rights (OHCHR), the overall death toll now exceeds 5,358 people, with another 12,235 wounded since mid-April last year. The civilian death toll from the fighting has been particularly high in the residential areas of both Government-controlled territory, such as the towns of Avdiivka, Debaltseve, Popasna and Shchastia and the settlement of Stanytsia Luhanska, as well as the cities of Donetsk and Horlivka controlled by the armed groups. In the single most deadly incident involving civilians, at least 31 people were killed and 112 wounded in Mariupol, following two attacks by multiple launch rocket systems. The Ukrainian crisis began to unfurl in late February 2014 when it evolved from an initial internal political crisis into violent clashes in parts of the country. It later reached full- scale conflict in the east. Despite the Minsk cease-fire, the situation in Ukraine has since continuously deteriorated, with serious consequences for the country's unity, territorial integrity and stability. Recent media reports have suggested a potential worsening of the situation amid claims of a massive recruitment campaign by anti-Government groups. The ongoing conflict in Ukraine is proving “catastrophic” for the country's civilians amid escalating violence, indiscriminate shelling, and harsh winter conditions which have made life increasingly precarious for millions of civilians, the United Nations High Commissioner for Human Rights, Zeid Ra'ad Al Hussein, warned today.